"Please help me. Please, Drake"
Shawn Mendes has his own legion of loyal screaming fans, but the Canadian pop star lent his support to fellow Torontonian superstar the Weeknd by attending the Starboy's recent hometown show. Drake had the same idea, but when Mendes attempted to approach Drizzy in the VIP section at the show, things took a not-so-friendly turn. As Mendes explained on The Late Show Starring Jimmy Fallon last night (September 13), he spotted Drake and decided to go over and salute the 6 God — but he was stopped by the rapper's security guard, who pinned Mendes' arms behind his back. "Next thing I know I'm in the middle of the Weeknd show with my arm hooked behind my back," Mendes explained. "Drake's security guard just has me completely at his mercy. And I'm like, 'Oh no!'" He continued, "I see Drake look over, and in my eyes I was like, 'Please help me. Please, Drake. In that moment, if he didn't remember who I was, I probably would have… I don't know what I would have done. I wouldn't been so embarrassed. I would've been in jail!" Luckily, Drake eventually remembered Mendes from a couple past meetings, and smoothed things over with the guard. Nevertheless, Mendes admitted, "I was terrified." 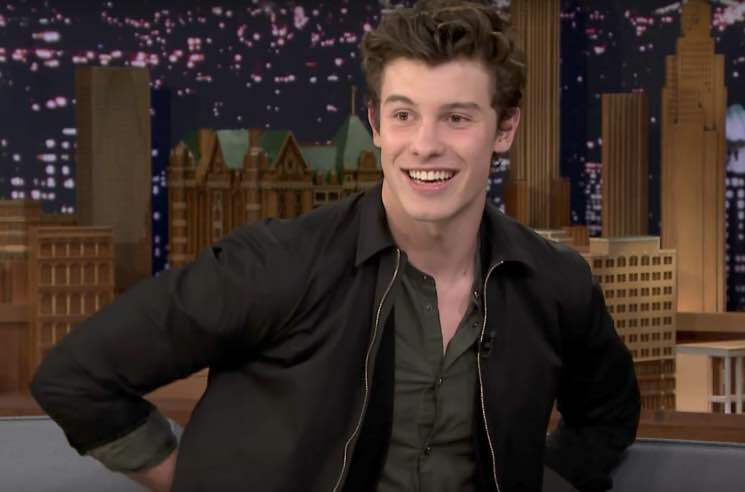 Watch Mendes recount the embarrassing run-in on The Late Show Starring Jimmy Fallon below.